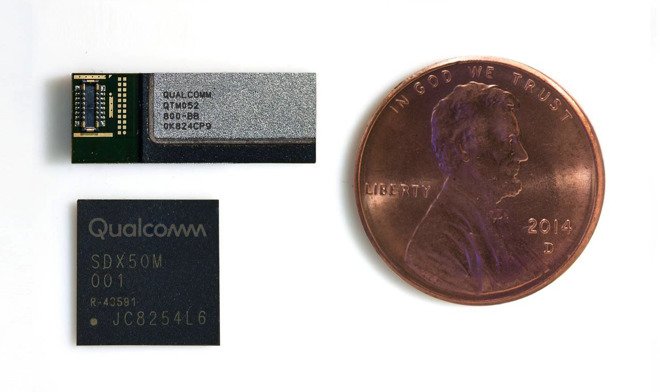 Qualcomm has revealed a new family of antenna modules designed to help mobile devices connect to 5G mobile networks, solving potential range and interference issues that may cause problems for the upcoming cellular technology. Claimed to be the first fully-integrated 5G NR millimeter wave (mmWave) module for smartphones, Qualcomm's QTM052 antenna is an important component for mobile devices, connecting to the radio modules and used for transmitting and receiving signals from the mobile networks. Qualcomm claims mmWave communications has yet to be used due to the "many technical and design challenges" of related components, including the form factor, thermal considerations, and regulatory requirements. There is also the issue of mmWave's spectrum's range of transmission being relatively short compared to previous cellular technologies, and it being more easily blocked by buildings, trees, vehicles, and even the user. The module itself consists of four antennas, accompanied by the QPM56xx sub-6GHz RF module, which takes up an extremely small amount of space. When used with Qualcomm's own X50 5G modem, up to four of the modules can be included in a device in various positions to work around the user's mass, meaning there could be up to 16 antennas in a single smartphone. Qualcomm has started to provide samples of today's announced modules to vendors, with the first devices capable of using the technology potentially available for launch as of the first half of 2019, most likely consisting of Android devices. It is likely that buyers of smartphones using the components in the United States will be able to take advantage of the technology on release. The major carriers have pledged to roll out 5G networks in a number of cities by the end of 2018 and throughout 2019. The iPhone models arriving this fall are not currently expected to be 5G-compatible, and it is unclear if Apple will even use Qualcomm's modules in a future release. While Qualcomm has come up with a cheaper licensing program for its 5G technology, Apple's ongoing legal battles with the company, as well as reports that it will be migrating away from Qualcomm in favor of Intel, suggest it won't happen.